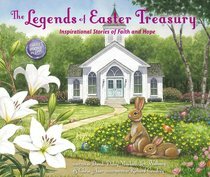 The Legends of Easter Treasury; Inspirational Stories of Faith and Hope contains three bestselling Easter stories that include The Legend of the Easter Egg, The Legend of the Easter Robin, and The Legend of the Sand Dollar. The Legend of the Easter Egg, written by Lori Walburg and illustrated by Richard Cowdrey, is a timeless tale that explores the meaning behind Easter eggs and the Easter story itself. This beautifully illustrated story of faith, love, and wonder includes explanations of the most common traditions and symbols of Lent and Easter. Educational and inspirational, The Legend of the Easter Egg is sure to delight both children and their parents. The Legend of the Easter Robin, written by Dandi Daley Mackall and illustrated by Richard Cowdrey, is a classic tale that explores the symbol of the robin and its connection to Easter and Jesus' death and resurrection. This Easter story reminds readers everywhere how much Jesus sacrificed for us and how much he loves us. The Legend of the Sand Dollar, written by Chris Auer and illustrated by Richard Cowdrey, is a tale filled with wonder and charm that explores the hidden meaning of Easter within the sand dollar. This Easter story reminds readers everywhere that when Jesus died for us and was resurrected, he promised hope for all. About "The Legends of Easter Treasury: Inspirational Stories of Faith and Hope"
Chris Auer of Savannah, GA, is a seasoned screenwriter and adapted The Legend of the Candy Cane for video. He has numerous scriptwriting credits, including More True Stories from Touched by an Angel with CBS. He was the creator-executive producer for the half-hour series Big Brother Jake from 1990 to 1994 and also worked for NBC's The Cosby Show.